1,131 backers pledged $91,542 to help bring this project to life. UPDATE 1: We hit our over funding goal of $15,000. This means every set (4 dice) will come with a nifty wooden dice box. UPDATE 2: I've add some extremely beautiful and rare woods for everyone to choose from in honor of the project hitting the $20,000 mark! Check out update 9 for details. You don't want to miss the 50,000 year old Ancient Kauri Wood. It is simply amazing. Here's a quick video to show you what it looks like. I also added Griselinia, Holm Oak, and Irish Bog Pine. As any gamer worth their salt knows, your geek cred at the gaming table is directly proportional to the size of your dice bag. But if you really want to wow your fellow players at the next gaming session then you need a set or three of custom handmade high quality Artisan Dice! Recently we started playing the Dresden Files RPG (If you haven't read the Dresden Files I highly recommend you do.) That RPG runs off the opens source Fate System, which requires Fudge Dice (mmm... fudge!!!) Sadly our local gaming shop was chronically out of stock for these dice. So I decided to make some really nice hand crafted dice for all of my players. They were such a hit that my players convinced me that the whole world should have a chance to own them and with that Artisan Dice was born! All that is left is to get enough support so we can order enough materials to start development. All Artisan Dice will be made from top quality exotic hard woods hand selected for the character and natural beauty. All Artisan Dice are hand polished to a deep luster and we don't use any stains in order to let nature's handiwork show through. They are sized from .75 to .83 inches depending on wood stock. 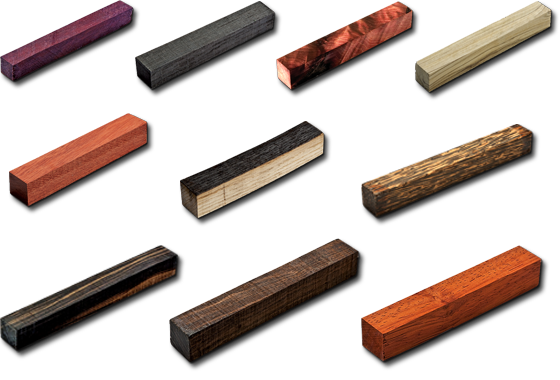 Just look at some of the types of woods we have available! For a complete listing of available wood stock, please visit our website for descriptions and larger images. There are almost 50 types of wood available for you to choose from. Get a single handmade artisan dice. You can choose between a Fudge dice or a standard D6. The type of wood used will be random, but top quality. Get the official Artisan Dice t-shirt and rock your superior geekatiude with style! Available in S, M, L, XL, 2XL, and 3XL. For 2XL and 3XL add $4 to your total. Handcrafted Charcoal Grey Micro Suede Dice Bag. This bag not only has that swanky micro suede feel it's the perfect size to hold 3 wooden dice boxes or a ton of loose dice. Get a set of 4 handmade dice made from your choice of any of the beautiful exotic woods we have listed on our site. All 4 dice will come from matched stock so that they will have similar grain patterns. Choose between Fudge dice or standard D6's. Handcrafted Chocolate Brown Micro Suede Dice Bag. This swanky micro suede bag is the perfect size to hold 4 wooden dice boxes or 2 tons of loose dice. A set of 4 dice (fudge or d6) made from Holm Oak. Holm Oak is native to the Mediterranean region. It's wood is very tough and is commonly used for making wine casks. We use this tree's distant cousin the White Oak to make wine and whiskey (Jack Daniels) barrels in the U.S. Holm Oak has a very distinctive tiger striping though out the wood grain and is very striking when finished. Get 2 sets of 4 handmade dice made from your choice of any of the beautiful exotic woods we have listed on our site. Each set of dice will come from matched stock so that they will have similar grain patterns. Choose between Fudge dice or standard D6's. 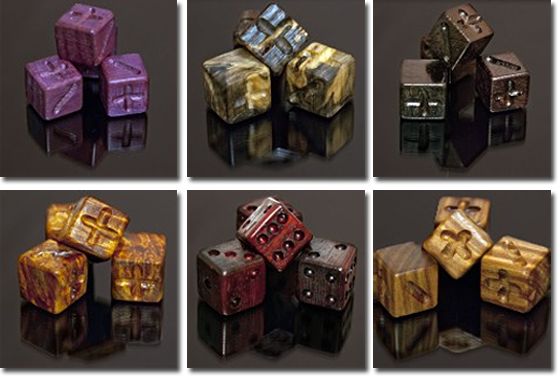 Get a set of 4 limited edition Reclaimed Old Growth Timber dice in your choice of Fudge or d6. These dice came from an old Tabaco Barn in North Carolina that dates to the Reconstruction Era of the late 1800′s. For pictures and information check out update #13. A set of 4 dice (fudge or d6) made from Jim Beam Oak Barrels. These dice are made from the barrels used to aged the finest Kentucky Bourbon for at least 4 years. Each set will come with a Certificate of Authenticity proving these dice really are loaded. In addition you'll get 2 random d6's made from other exotic hardwoods. A set of 4 dice (fudge or d6) made from Jack Daniel's Oak. Yes, that Jack Daniel's. We have a limited availability of certified oak barrel staves that were soaked in the world's finest Tennessee Whiskey for 7 years. Each set will come with a Certificate of Authenticity proving these dice really are loaded. As if you couldn't tell by the aroma. In addition you'll get 2 random d6's made from other exotic hardwoods. A set of 4 dice (fudge or d6) made from Jack Daniel's Oak. Yes, that Jack Daniel's. We have a limited availability of certified oak barrel staves that were soaked in the world's finest Tennessee Whiskey for 7 years. Each set will come with a Certificate of Authenticity proving these dice really are loaded. As if you couldn't tell by the aroma. In addition you'll get 2 random d6's made from other exotic hardwoods. A set of 4 dice (fudge or d6) made from Ancient Bog Oak. How Ancient? Let's just say Methuselah can't compete. These dice are carbon dated to be at least 5000 years old. Each set comes with a hand crafted cedar dice box and a Certificate of Authenticity to verify the carbon dating. A set of 4 dice (fudge or d6) made from Irish Bog Pine. Pulled from the same bogs as the Ancient Bog Oak, IBP is carbon dated to over 3000 years old and finishes to a wonderful woody luster. Each set comes with a hand crafted cedar dice box and a Certificate of Authenticity to verify the carbon dating. A set of 4 dice (fudge or d6) made from Pink Ivory. How pink is Pink Ivory? Well it’s pink. Very pink. Barbie Pink. Pink Ivory was a sacred wood to the Zulu chiefs of South Africa. If was said that if anyone other than a Zulu chief was found to posses the wood, they would be executed. At one time, it was said to be rarer than diamonds. The wood grows in various parts of Africa, and takes hundreds of years to reach a size suitable to make a blank. It turns out however, that it is not quite as rare as we have been led to believe, and nowadays this extremely slow growing, and exceedingly hard wood is harvested with proper permits from the South African government to ensure a sustainable harvest for decades to come. A set of 2 six sided dice made from Petrified Arizona Rainbow Wood. This wood is collected from around the Petrified Forest National Park, and dates to the Late Triassic period of the Mesozoic era (around 225 million years ago). Rainbow wood is so named for the mesmerizing rainbow of colors it come in. All petrified woods will come in a classy dice box that is still being developed. Please see Update #15 for more information and photos. Yes there is an increase in cost from the last run of Bog Oak. Keep in mind that Irish Bog Oak is very hard to come by and quite expensive so this is the best I could do. A set of 4 dice (fudge or d6) made from Ancient Bog Oak. How Ancient? Let's just say Methuselah can't compete. These dice are carbon dated to be at least 5000 years old. Each set comes with a hand crafted cedar dice box and a Certificate of Authenticity to verify the carbon dating. Yes there is an increase in cost from the first run of Bog Oak. Keep in mind that Irish Bog Oak is very hard to come by and quite expensive so this is the best I could do. A set of 4 dice (fudge or d6) made from Ancient Bog Oak. How Ancient? Let's just say Methuselah can't compete. These dice are carbon dated to be at least 5000 years old. Each set comes with a hand crafted cedar dice box and a Certificate of Authenticity to verify the carbon dating. Yes there is an increase in cost from the last run of Bog Oak. Keep in mind that Irish Bog Oak is very hard to come by and quite expensive so this is the best I could do. A full set of Jayme's Dice. This set of dice is named for my mother who passed away a couple of years back. It includes 6 dice made from (2 each) Purple Heart, Pink Ivory, and Blue Mahoe. Three woods that bare the names of her favorite colors. They will be shipped in a pure white American Holly Dice Box to show case the vibrant coloration of the dice. This set is only available in d6's as my mother would have never played a game that used Fudge dice. You can see photos and descriptions of the woods in Update #10. This is by far the most colorful set of dice Artisan Dice will offer. A set of 2 six sided dice made out of Blue Forest Petrified Wood from Eden Valley in Wyoming. This wood is the petrified remains of 50 Million year old Palm Wood that grew on the shores of an Ancient inland sea. It's a dark blue black agate interlaced with white veins running through it and is only found in Eden Valley. All petrified woods will come in a classy dice box that is still being developed. Please see Update #14 for more information and Photos. A set of 4 dice (fudge or d6) made from Griselinia wood. Griselinia is an epiphytic (grows in other trees) tree. It is native the upper canopies of New Zealand's wetter climates. It's wood is quite beautiful (you can see photos in Update #9) with rich pinks and greens throughout. Though the tree is quite common, it rarely produces workable wood of any size, so given it's rarity and natural beauty Griselinia demands a hefty price tag. A set of 4 dice (fudge or d6) made from Methuselah's cousin. Bristlecone Pines are among the oldest living creatures on earth. None of these ancient majestic trees were harmed in the make of these dice as only the dead wood that has fallen to the ground is collected to use. For more information on these trees please see update #11. A twelve dice grab bag that comes with 3 custom dice boxes designed to commemorate our super successful Kickstarter Launch that are packed full of dice made from some of the best wood choices slated to be added to the Artisan Dice line later this year. Not only will you get them early, you'll also get a swanky hand crafted charcoal grey dice bag to keep your dice boxes in! A twenty-four dice grab bag that comes with 4 custom dice boxes designed to commemorate our super successful Kickstarter Launch that are packed full of dice made from some of the best wood choices slated to be added to the Artisan Dice line later this year. But not only will you get them early, you'll also get a swanky hand crafted chocolate brown dice bag to keep your dice boxes in! (Please note the reward above for $179 has a typo. It should read 16 dice not 24 dice. The following information is the correct information for the $179 backer level.) A sixteen dice grab bag that comes with 4 custom dice boxes designed to commemorate our super successful Kickstarter Launch that are packed full of dice made from some of the best wood choices slated to be added to the Artisan Dice line later this year. But not only will you get them early, you'll also get a swanky hand crafted chocolate brown dice bag to keep your dice boxes in! A set of 2 six sided dice made from Petrified Chromium Wood the crown jewel in the Artisan Dice line of Petrified Woods. It is exceedingly rare and only happens when chromium leeches out of the ground water during the agatization process while the wood is being fossilized. It turns the wood/stone a bright minty green that changes brightness depending on how damp the stone is. The effect can even be brought on by changes in humidity. Due to the rarity of this type of petrification only 6 pairs of dice will be produced at this time. All petrified woods will come in a classy dice box that is still being developed. Please see Update #15 for more information and photos. A set of 4 dice (fudge or d6) made from the oldest workable wood on the planet. Ancient Kauri Wood carbon dates to over 50,000 years old. It is found only in the bogs of Northern New Zealand. And is by far and away the most beautiful wood mother nature every created. Pictures do NOT do it justice. The grain pattern is alive with an iridescence called Whitebait. So named after the schools of fish that swim off the New Zealand coast where these trees are found. Ancient Kauri Wood is full of warm rich tones with a golden iridescence that dances in front of your eyes. In order for Ancient Kauri Wood to achieve it’s full beauty it must be hand sanded to 2000 grit or higher. By contrast the rest of the woods available from Artisan Dice are only sanded to 600 grit. So not only is the wood expensive, but it takes a considerable effort to work with the wood as well. All Kauri dices sets will come with an Artisan Dice t-shirt and a matching Kauri Dice box, because to put Kauri wood in anything else would be a sin. Each set will also come with a Certificate of Authenticity. A set of 4 dice (fudge or d6) made from one of the world's most colorful and exotic species of wood, Bois de Rose. These trees are grown only in Madagascar. Due to trade regulations and black market logging, this tree is no longer legal to import or export. So this option is only available for U.S. residents. Please note that these dice are made from stock that was imported before the ban which is the reason there are only 3 sets available. For more information please see update #13. These sets will come in a Wenge wood box that is as black as night to compliment the coloration of the dice. A set of 4 dice (fudge or d6) made from one of the world's most colorful and exotic species of wood, Bois de Rose. These trees are grown only in Madagascar. Due to trade regulations and black market logging, this tree is no longer legal to import or export. So this option is only available for U.S. residents. Please note that these dice are made from stock that was imported before the ban which is the reason there are only 3 sets available. For more information please see update #13 and 17. These sets will come in a Wenge wood box that is as black as night to compliment the coloration of the dice. Anyone who picks this set in the final hours of this Kickstarter will get all 12 dice in custom dice box commemorating their help in launching Artisan Dice and making it the most awesome dice company around. The Petrified Woods Collectors Set. Yall asked for it so here it is. It's not cheep but you'll get 8 different petrified woods. Including McDermitt, Blue Forest, Rainbow Wood, and 5 new types of petrified wood not yet available. Much like the grab bag sets the other 5 woods will be a surprise as they are not slated for release until later this year. You can get them early in this set though. Polyhedral Dice (d20 Sets): If you want to see Artisan Dice produce quality hand finished Polyhedral Dice then you can help us develop that product much quicker than I could on my own. In addition to gaining input on the development side, each backer will be receiving 7 sets (4x d6, d4, d8, 2x d10, d12, & d20 included in each set) of prototype polyhedral dice to play test with their gaming groups and a very swanky Artisan Dice t-shirt to go with each set of dice. Each prototype set will be crafted from a different type of exotic hardwood and come in a matching numbered case made from the exact same wood stock as the dice themselves. The DM’s set will be made from Ancient Bog Oak. The player sets can be made from almost any other wood we have available the choice of which will be left up to the backer. Each dice box will be engraved with a message of the backer’s choosing in addition to the Artisan Dice logo and the set’s Prototype Number. These prototype sets will be the only polyhedral dice produced at this time. So help Artisan Dice develop hand finished artisan quality polyhedral dice made from mother nature's finest woods, get some seriously cool swag, and an Artisan Dice t-shirt for you and six of your closest friends. What's not to love? Oh, you'll also receive my eternal gratitude and should you ever get the opportunity to play in a game I run, you'll automatically start off with an extra 10,000 XP to boot.